I became aware of Christina Boyd through the Austenesque anthologies penned by The Quill Collective. Christina is the driving force and editor behind the books, which have enjoyed remarkable success, not least due to their strong author lineup, bold premises, and striking covers. The stories in the Darcy Monologues feature everyone’s favourite male protagonist from Pride and Prejudice. Dangerous to Know shines a spotlight on some of Jane Austen’s “Rakes & Gentlemen Rogues”. 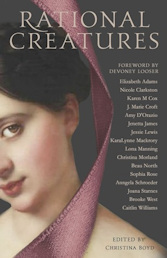 Rational Creatures (due in October) switches emphasis to Austen’s female characters. Q: Let’s go back to before The Darcy Monologues appeared. Why decide to do an anthology of short stories in a field dominated by novels and novellas? Pride and Prejudice is told in the third-person narrative, limited omniscient, from Elizabeth Bennet’s point-of-view. In my fiction, I have always had a weakness for the rich, powerful, noble, and handsome man who changes his “less desirable” ways for love and a woman worthy of his efforts. I’ve long dreamt of putting together a collection of stories all from my favorite Austen hero’s eyes. What I REALLY dream about is a TV series based on The Darcy Monologues with each of the short stories an episode or two. Throughout the entire series, the same actors play the same characters—regardless of setting or era. Q: Later this year, you’ll be bringing out your third anthology. The first two were built around Jane Austen’s male characters, but Rational Creatures puts her female characters front and centre. What’s the thinking behind this? When asked about doing another anthology, readers frequently suggest another Darcy book or Elizabeth’s stories… But for me, it seemed to make sense, during this time of forwarding feminist sensibilities and given the verve of the present equality movements that the female perspective might be embraced amongst the Austen fandom—possibly beyond our polite borders. After all, Austen wrote of strong women who were ahead of their day. The authors I asked to take part in this endeavor, #TheSweetSixteen, all seemed keen to share their feminist bent on an Austen female character. Jane Austen’s novels evoke romantic imaginings of fastidious gentlemen and gently-bred ladies… Yet through her veiled wit, honest social commentary, and cleverly constructed prose in a style ahead of her day, Austen’s heroines manage to thwart strict mores—and even the debauchery of Regency England—to reach their fairytale endings. Have you never wondered about her other colorful characters like Mary Crawford, Hetty Bates, Elinor Tilney, Louisa Musgrove, et al.—and how they came to be? In Persuasion, Mrs. Croft says, “But I hate to hear you talking so, like a fine gentleman, and as if women were all fine ladies, instead of rational creatures. We none of us expect to be in smooth water all our days.” Those words have always struck me as terribly modern and I have wondered what Mrs. Croft might have been thinking of when she said those very words to her brother Captain Frederick Wentworth. I believe several of Jane Austen’s characters might have had feminist sensibilities, even if they yielded to the expectations of their sphere. It is our intent that in this collection of backstories or parallel tales off-stage of canon to remain true to the ladies we recognize in Austen’s great works—whilst stirring feminism in the hearts of some of these beloved characters. Thus, our title was born. Rational Creatures. Further, I could think of no one more fitting to write the foreword than Austen scholar, Guggenheim Fellow, and author Devoney Looser. I am thrilled (and not a little star-struck) that she would think enough of the concept and my previous projects to take this on. Q: In the anthologies, you have numerous authors writing in different settings, historical eras and styles. What challenges does that pose for you as the editor? The only anthology that had different eras was the first, The Darcy Monologues. The challenge then was to keep Darcy the man we know and expect. Rich. Powerful. Noble. Handsome. If the author wrote him in another era, he still had to be recognizable to fans of Pride and Prejudice. Dangerous to Know: Jane Austen’s Rakes & Gentlemen Rogues has stories set in the Georgian era and all are either a backstory or parallel tale off-stage of canon—whilst remaining steadfast to the characters we recognize in Austen’s great works. Rational Creatures is in that same concept—parallel stories to canon or prequels leading to canon or even a mini-sequel. As the editor, and in the spirit of the collective while maintaining consistency throughout, the anthologies adhere to US style and punctuation, though some of the authors prefer to use British spellings. Q: It’s fascinating how Jane Austen’s novels and characters can be reworked in so many diverse ways, each of which finds an audience. Why do you think that is? Her work is timeless and because many wish she had written more (we are greedy creatures in that), we cannot help but let our imaginations wander and wonder “what if?” Out of those musings, a story is born. I think the Jane Austen fandom has a wide enough umbrella to welcome all types of fans and readers. Q: How did your interest in Jane Austen’s novels arise? Albeit I read Jane Austen as a moody teenager, it wasn’t until Joe Wright’s 2005 movie of Pride and Prejudice that my interest in all things Austen was really sparked. After reading The Six major works again, my thirst for more simply could not be slaked, despite having discovered on-line Jane Austen fan fiction (JAFF), purchasing ALL the movie adaptations, and even joining and attending my first Jane Austen Society of North America (JASNA) Annual General Meeting (AGM)—all within that first year! Eventually, I became a life member of JASNA, and my addiction continues. I confess, I become totally immersed in my passions—and my friends forever remind me that it’s provident I use that ardor for good! Q: What’s your favourite Austen novel? Usually whichever one I re-read last. Q: What’s your favourite Austen quote (from a book or letter)? “There, I will stake my last like a woman of spirit. No cold prudence for me. I am not born to sit still and do nothing. If I lose the game, it shall not be from not striving for it.” (Mary Crawford, Mansfield Park). Q: What/who are your other literary and artistic inspirations? Memoirs of a Geisha by Arthur Golden is one of my favorite books. I love Philippa Gregory’s first-person POV storytelling-style and how she makes the reader have such empathy for the narrator; then she changes to another’s POV, and boom, the readers’ loyalty switches to that character. Q: Which Jane Austen character should Henry Cavill play? When I handed Henry a copy of The Darcy Monologues, I explained the entire concept of the anthology and how he is always Darcy when I dreamcast. But I also think he could play any of the rogues well—except John Thorpe. No. Never Thorpe. Thank you, Mark, for shining your light on this project and the work. I am honored by the attention and excited for the upcoming “Rational Creatures” anthology. The stories are poignant, thoughtful, and I THINK, true to Austen’s original characterizations. #strongwomen indeed. I hope readers are looking forward to it too. My pleasure, Christina. Thank you for all your wonderful answers. Am very much looking forward to what all those top authors come up with in the anthology. Glad you enjoyed it, Denise. I hope that the Quill Ink anthologies are a gateway drug for JAFF readers who only know Pride & Prejudice, to sample Austen’s other novels! Smashing interview, Mark and Christina! Thank you! I’m a big admirer of what Christina has done (and continues to do) with the anthologies. And Mr Bennet has port and pen to hand and promises to write away over the summer! Thank you for your kind words. I am so glad to know you are enjoying the projects and what we are doing with the anthology series. Yes! 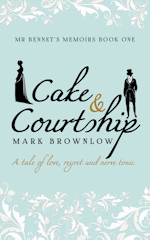 I just read the first book in the Mr Bennet’s Memoirs series. 5-stars! Looking forward to the coming books. Wonderful interview! So proud to be part of this project, and can’t wait to read the other stories! Thanks, Karen. It’s a great idea with great people involved, so I’m looking forward to seeing what comes out. I’m late to the party. I just read Dangerous to Know and absolutely loved it! I suggested it for our next JASNA book club. Thanks so much for this interview. I’m now picking up the other two anthologies in the Quill Collective and will check out the Mr. Bennet memoirs. Glad you enjoyed it, Sara!